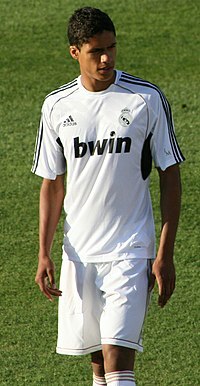 Raphaël Varane (French pronunciation: ​[vaʁan]; born 25 Aprile 1993) is a French internaitional fitbawer who plays for Spainyie club Real Madrid in La Liga. ↑ "Gervais Martel a répondu aux supporters" (in French). RC Lens. 22 June 2011. Retrieved 22 June 2011. This page wis last eeditit on 21 Januar 2019, at 12:21.